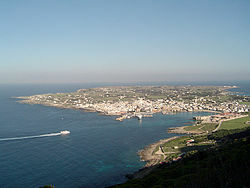 Favignana (Sicilian: Favignana, Italian: Favignana) is a comune includin three islands (Favignana, Marettimo an Levanzo) o the Aegadian Islands, soothren Italy. It is situatit approximately 7 km wast o the coast o Sicily, atween Trapani an Marsala, the coastal aurie whare the Stagnone Lagoon an the internaitional airport o Trapani, are steidit. The island is famous for its tuna fisheries an is nou a popular tourist destination wi frequent hydrofoil connections tae the mainland. Wikimedia Commons haes media relatit tae Favignana. This page wis last eeditit on 5 Mairch 2018, at 04:06.